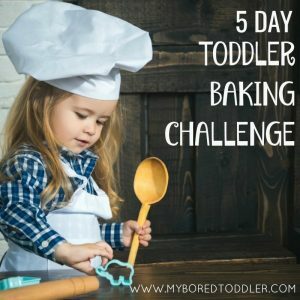 Having a toddler and a baby can often mean trying to cook two different meals for the kids, as well as something for you and your partner and in my case remembering to feed the dogs as well. My girls were less than 2 years apart so there were days when things were crazy! While I had every intention of making my own baby food, the reality is that life is super busy and that is just not always possible. We were always out and about, and I was (and still am) grateful for the convenience of being able to buy baby food that is nutritious when needed. I’m quite passionate about not feeding kids junk food and am an avid label reader. 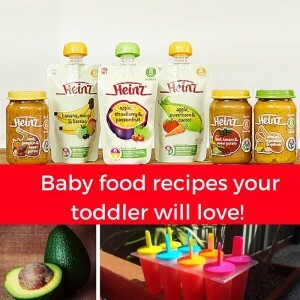 It’s great to see that the baby food companies like Heinz are jumping on board and providing quality, nutritious, food that is full of only the ‘good stuff’. They are also ticking all of the boxes by using Australian fruit where possible, Aussie meat, and producing their pouch, jar and canned baby food in Australia. We’ve been trying out the Heinz range of baby food and it’s great to know that it’s full of only the ‘good stuff’, with nothing artificial added. One of the ways that I was able to save time was to sometimes feed my toddler the same food as my baby. It made making the toddler food so much easier. It also solved a small part of the jealousy problem that was occurring in my 2 year old, as she wanted to do everything the baby was doing. Finding food that they could both eat was definitely a big time saver. Here’s a few of the tips I discovered, and the baby foods that they both loved eating. When you have a baby starting solids it feels like you spend a LOT of time pureeing foods. I found it easier to make big batches and freeze them, and if I was making fruit purees, I would turn half of them into ice blocks that my toddler could enjoy as a healthy treat. These were also excellent for teething. To make the ice blocks I would simply mix half of the pureed fruit with equal amounts of water and freeze in ice block moulds. You can buy these from most department or discount stores. Sweet Potato – so many ways! They say that sweet potato is a super food and I would have to agree. Both of my girls loved this when they were babies (still do). This is such an easy food to share with the whole family with very little alteration. Mashed sweet potato was a hit with the baby, a great side dish for my toddler, and with a few herbs & spices also formed part of our evening dinner too. Avocado is one of the healthiest foods you can feed your baby, and it’s a great snack for a toddler too. They can eat it plain, or on crackers or as a dip with steamed carrots or rice crackers. While I try my best to feed my toddler fresh fruit, sometimes the quantity that they eat is really limited. Have you ever seen a toddler eat an apple? It takes them half an hour and they eat about 1/20th of the actual apple! I try to keep a few of the Heinz fruit pouches in my bag (the apple strawberry and passionfruit is our favourite) all of the time, as they are a great fruit snack when we’re on the go, and babies and toddlers can snack on them. In fact I used to give my toddler the left overs of the baby’s one, as she would always leave a little bit in the bottom! The fact that they are made from fruit, means they are ticking all of the healthy boxes, and I loved that they didn’t have to be kept refrigerated (until they were opened). Great for an emergency snack. Half eaten baby food – mix it with pasta! I’m sure that there’s a baby handbook that says “Thou shall not eat the full jar of food … ever!” Don’t put the half eaten jars in the fridge (you’re guaranteed to forge t about them) instead mix them with some pasta, add a bit of cheese on top and you’ve got your toddler’s dinner sorted. Easy! The Heinz Pumpkin , Potato and Beef was always a hit. Do you have any time saving tips for feeding a baby and a toddler? 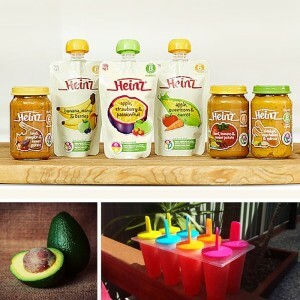 If you would like to find out more about the Heinz baby food range, all full of the “good stuff” you can visit their website to see a full range of their products http://www.heinzforbaby.com.au.